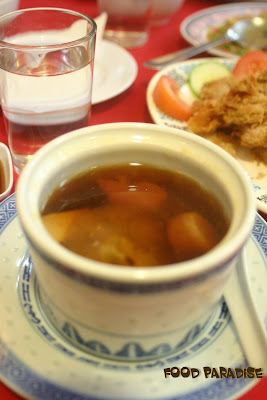 Today, I am going to blog about Restoran Double Dragon Inn. We almost forgot the existing of this shop until last year when my sis in law and her friend brought my hubby's uncle to this shop for dinner. Since then we been wanting to go and try out their foods. But always kept forgetting it. Until few months ago where we have the chance to step in this shop and try out their foods. Location: 27B Gottlieb Road, 10350 Penang. This is actually the last add on dish that we order. As after finished our order, we saw that they also serve "Phau Chee" and it is also their "Chef Special" for RM69. So hubby was asking whether we wanna try it out since we need to wait for others food to come. After not sure how long, this is being served after all the dishes. And the tastes is very authentic flavour from all the shark fin, dried scallops.......... But my gal doesn't like it as she prefers other type of soup. The uncle who took our order suggest this dish to us. The deep fried chicken tastes nice. The chicken is very tender and crispy. You can either dip with the sour plum sauce provided or eat it without the sauce. I found that both choices are great. Actually, I cannot recall the name of this dish. I just recall that the uncle asked if we want some prawns. And he told us that my gal will love this dish. So no harm of trying. Although this plate of prawn looks very simple but it tastes not bad too. Especially the prawn. Prawn is not over cooked or under cooked. Just perfect timing. That's one of our weekend lunch. There are many people patronise this shop too. The shop is air condition. So it is one of the good choices to have a nice weekend lunch. That Sour Plum Deep Fried chicken looked great! It looks like an interesting place to dine. never been there b4, but will try this out...heeee. btw, i missed the Kam Steamboat located at the same roll long time ago, but it was closed down. Gill, the kam kei steamboat moved to Jalan Gajah loh. the restaurant sounds so kung fu style la.... dragon inn not enough, want double somemore. is there any called triple dragon inn restaurant? lol. This used to be a family favourite when we were kids... the interior still looks exactly like it did 20 years ago! :-P I remember the birthday noodles, very nice and simple stuff! this place sounds so "Mo Hup"! I can imagine swords flying everyway! lol! me as usual full of imaginary flashing through my mind! food looks right too! BBO - yes agree with you and allen, the name is something special. Foods are ok.